You may be interested in purchasing quality clothing. You can purchase them at H and M at very reasonable prices. As a matter of fact, there are items that you can buy at half price. Choose from a wide variety of clothing items, from shirts, pants, shorts, and more. You can also save money when you buy in bundles. Our community of bargain hunters have gathered the latest H&M voucher codes, deals, and offers for you to take advantage of. We will gladly help you have a convenient and fun shopping experience while saving money in the process. Metal Milk Jug with Spout at the Top Handle at the Side. Buy a £40 Gift Card, Get £4 for Yourself! Small Pot with a Frosted Glass Base and Clear Glass Lid. .
H&M is an international Swedish clothing-retail company founded in 1947 by Erling Persson when opened his first store in Västerås, Sweden. The shop was known then as Hennes, which means hers in Swedish, and sold only women’s clothing. Today, the company is popular for its fast-fashion clothing for men, women, teenagers and kids as well as home products. H&M has more than 41 online markets and 4,500 stores in 66 markets. The H&M Group is one the leading fashion companies in the world and includes brand such as H&M and H&M Home, COS, & Other Stories, Monki, Weekday and Cheap Monday. The company stands for sustainable and sustainability fashionable. Their goal is to create a better fashion future. H&M is also popular for collaborating with the best names and brands in the fashion and music industry such as Karl Lagerfield, Viktor & Rolf, Stella McCartney, Roberto Cavallie, Kylie Minogue and Madonna just to name a few. These special collections are release every last quarter each year. 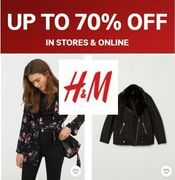 H&M’s online shop offers great offers such as up to 70% off on select styles just like with TopShop. You can also enjoy 10% off and free delivery on orders over £60. If you’re looking for the best and latest H&M discounts codes and voucher codes, you will find it here on LatestDeals.co.uk shared exclusively by our massive community of bargain hunters each month! Ladies: Shop the latest fashion online at H&M and discover new favourites in women’s clothing. Find everything from casual day dresses to sharp office wear. They have jeans in every fit, premium quality items and the latest fashion essentials as well as finishing touches such as bags, shoes and accessories. Men: They offer current men’s clothes in good quality and at a great price from basic fashion to latest fashion. If you are insecure about your style you should always be able to find something at H&M. Kids: Adorable clothes for babies, toddlers and teens. Find new fashion favourites in their wide range of kid’s clothing. H&M Home: H&M Home is a modern, inspiring and diverse interior design brand. Making it possible for lots of people to update and decorate their homes with well-made products that offer value for money. Sale: Shop the sale online at H&M and stock up on lots of great deals! Discover new marked-down favourites from all our departments; women, men, kids and home. How do I contact H&M? You may send them an email using their Online Contact Form. What are the delivery options for H&M? Delivery is 2-3 days after receiving your order confirmation. They will deliver to residential addresses 7 days a week, except Bank Holidays and to Parcel Shop on working days (no delivery on Sundays and Bank Holidays). Standard delivery is free for orders over £50. During high season and Sale, delivery might take a little longer. £5.99, next day delivery for orders placed before 9 pm. Your parcel will be delivered the next day before 8 pm. Orders placed after 9 pm will be delivered within 2 days. During high season and Sale, Next day delivery might be unavailable. Pick-up in store is FREE for orders of £20 and over, or £3.99 if you spend less. Select Pick-up in store in the checkout. You will get confirmation messages both by text message and email. Your parcel will arrive to the selected store within 2-3 days, Monday-Saturday. You have 7 days to collect your parcel from the date it arrives to the H&M store. Just remember to bring your ID and your Pick-up code as we are not able to hand over your parcel without it. Pick-up in store is currently available in following stores in London: Regent street, Oxford street East, The Strand, Oxford Circus, Camden, Westfield, White City, Wood Green and Westfield, Stratford. You may track your parcel under “Orders” when you login at My H&M. For more information, read their full Shipping and Delivery page. How do I return an item to H&M? You can withdraw your order within 28 days without giving any reason from the day of the delivery of the last product in your order. All their parcels come with a return form to use when you send items back. Fill in the return form using the code that best explains the reason of your return and place this together with the item you wish to return in the parcel your order arrived in. Items purchased in store must be returned to store. You can easily arrange for a Hermes Courier to pick up your return yourself via the Hermes portal. When clicking on the link you will be redirected to right page immediately, and you just need to enter your order reference number and select the date for the pickup. You can also arrange for a Hermes courier to pick up your return using their contact information provided on the yellow sticker attached to the parcel, or contact H&M Customer Service on 0344 736 9000. Attach the self-adhesive return label, which you can find on the Delivery note and take the parcel to a convenient Parcel shop of your choice. Attach the Royal Mail return label, found in the parcel or you can print a free return address label via Royal Mail, and take your return parcel to the nearest Post Office. Do not forget to get proof of postage. You may return items to any H&M store in the UK, excluding H&M outlet stores. Just bring the Delivery note with the barcode along with the item(s) you wish to return to the store. Purchases paid completely by card will be refunded as original payment method. If you have paid using any other payment method (Paypal, gift cards, credit options etc) or a combination of payment methods we will refund you by a merchandise card which you can use in all H&M stores all over the UK and at HM.com. Give the gift of fashion! Whether your loved one is dreaming of a whole new style, or searching for the perfect addition to their favorite look, your gift will make their dreams come true! H&M Gift Cards can be used for shopping in any store and on HM.com. Surprise someone with the gift they really want! On October 19 in New York, KENZO x H&M made its runway debut with a spectacular show directed by fashion legend Jean-Paul Goude. Guests were invited to experience the uniquely vibrant and playful energy of the KENZO x H&M collection designed by KENZO Creative Directors, Carol Lim and Humberto Leon. To the rhythm of a customized remix of “Express Yourself” by Sam Spiegel, dancers, beatboxers, whistlers and musicians came together to celebrate the beauty and power of individual expression. Through a unique choreography created by KENZO collaborator, Ryan Heffington the show cast presented the KENZO x H&M collection to an audience who experienced an inferno of playfulness, bold prints and vivid colors. As the show finished the celebration continued with a performance by rapper and surprise guest Ice Cube. The collection will be sold in over 250 selected H&M stores worldwide, as well as online, on November.